By Steven Ocallaghan: After a long drawn out affair about who is the best pound for pound fighter on the planet, I think after Manny Pacquiao’s last 3 bouts, he has finally relinquished the mantle of number 1 fighter on the planet. If Floyd Mayweather now gets the fight I think he would win in a fairly one sided affair. Mayweather always knew the right time to fight and very rarely took a fight that he thought might be tough. He nearly got caught out against a tired Oscar De La Hoya and that for me is the main reason the Pacquiao fight never happened. After his loss to Eric Morales in the summer of 2005, Pacquiao had almost been unbeatable. 4 fights in particular, Ricky Hatton, Miguel Cotto, Joshua Clottey and Antonio Margarito, he was sensational. Pacquiao managed to maintain the speed, power and accuracy all the way through his career, considering he made his pro debut weighing 106lbs to his last fight against Tim Bradley at which he weighed 147lbs. The considerable weight gain through the years and also his political interests seem to have had an effect on his most recent performances. He was sluggish against Mosley, he always has trouble against Marquez then came up a little short in the judges eyes against Bradley. 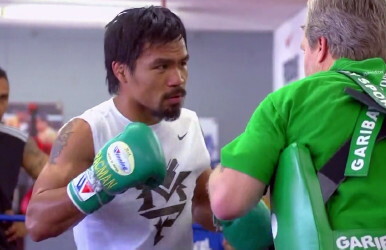 This is why I think Mayweather will look to get the fight on next year because he knows Manny is on the slide. Realistically look at a lot of the big fights Mayweather has been in, can you honestly say they where all at the top of their game. Floyd is a brilliant fighter, but also a very smart one, that is why now I think the Mayweather v Pacquiao fight will be made, it’s just unfortunate it wasn’t 3 years ago when, in my mind Pacquiao would have won.